I've been obsessed with this tie since I first caught a glimpse on all plaidout. It would make a subtler choice for a groom than an ironic tuxedo t-shirt, no? Not to mention a hella rad gift for groomsmen. Email Mister Mort directly to inquire about orders (and peruse his blog for sartorialism with a sense of humor). Mr. Mort also does velvet bow ties in black, blue, purple and orange, but my heart is with the FUCKYOU. For obvious reasons. I don't think I would want to stand up with my man and face him in an FYou tie. Or have him facing all of our favorite people in it. I do love the tie, very subtle and clever and yet still saying my favorite expletive of all time. What if you were wearing F U alphabet rings? No? click, ctrl C, send to BF. An other great groomstyle posting from Le ESB! oh my goodness kiwi would kill for one of those bow ties! christmas gift, check! it's real trouble being married to a man who has his own custom clothing company... his closet is bigger than mine. what's one more bow tie i suppose. p.s. we actually took the pics with a fuji instax camera... so i guess they aren't technically polaroids. but the title, 'instax wedding photos' didn't have quite the same ring to it. ohhhhhhh!!!!!!! 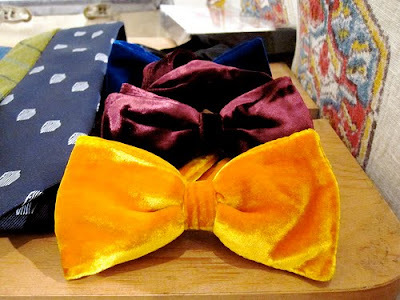 VELVET ; ) ties! yeah! haha, the f*ck you pattern is genius you really can hardly read it. I would find it irritating if my future husband would wear it on our wedding , though! I love bow ties. I wish more men would wear them. Bring back bow ties! They're sharp. I can't get the boy to wear one for anything. He's afraid. Now that guy knows how to dress.